A couple of years ago I met up with Jeremy Sutton-Hibbert, a Tokyo based photographer who produces fantastic images for clients ranging from The Guardian to Greenpeace. During our conversation he asked which photographers I was inspired by. There was a rather embarrassing pause, followed by me admitting that I had always been inspired more by TV and movies than photographers. The truth is it was the images from documentaries like The Trials of Life and movies such as Dances with Wolves and Braveheart that were truly awe-inspiring. There is one film above all others that really affected me – Baraka. 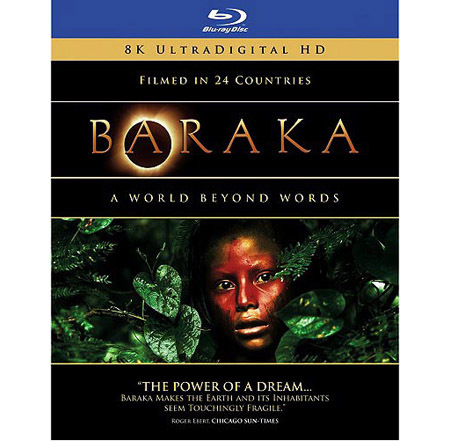 Baraka is a fantastic journey through 24 countries with breathtaking cinematography. I was amazed when I saw it 14 years ago as a university student, and it still inspires me. One wonderful thing is that I have now been to some of the places captured in the film. I have witnessed snow monkeys relaxing in their hot spring pools, and thousands of commuters surge through Tokyo’s stations. In a previous post I talked about film size and the tradeoff between film size( and therefore image quality) with portability and cost. Just as my still camera uses film that is 56mm x 67mm to get higher image quality than 35mm film. Baraka was filmed in 70mm film rather than the standard 35mm motion picture film format (Lawrence of Arabia was also filmed in 70mm). For a few years I have had Baraka on DVD but happily gave this copy to a friend as now Baraka on Blu-ray has been released. The original 70mm film was restored and rescanned at extremely high resolution to produce images that will once again inspire awe. Is it the greatest film ever made? Maybe. Perhaps, I shouldn’t feel so embarrassed that my inspiration comes from the moving pictures after all. We are looking forward to watching this film very much. Previous PostDo you use a tripod?